So I meant to make this a really brief Kombucha Brewing Recipe, but there was too much important information! So the truly short and simple recipe may have to wait. And I promise to post more Kombucha brewing/bottling details! These are just the "essential basics"! Note: DO NOT use soap, which can kill some of the bacteria/probiotics! Please clean with distilled vinegar or some sort of sanitizer used by brewers, such as Iodophor! 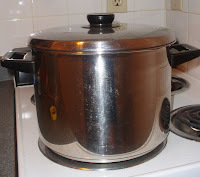 -Not for too long- remove the pot from the heat once the water reaches a boil. -Boiling reduces the oxygen and carbon in the water, which are needed for the fermentation process. Add the tea and allow it to steep for 15 minutes (or follow the specific tea brewing instructions). Remove the tea bags/tea leaves (or you can leave them there overnight. It's your choice). Add the sugar and mix it until it all dissolves. -Leaving it overnight is easiest. -Make sure the mixture is properly covered so nothing gets inside! Pour the sugar/tea solution into the brewing container. Add the starter tea into the brewing container and stir it so that it’s evenly distributed throughout the solution. -Optional: check the pH of the liquid. You want it to be between 3-4. -You want the temperatures of the sugar/tea solution, starter tea, and the SCOBY to be the same so that the SCOBY won’t get temperature shocked. SCOBYs are living things! Cover the container with the clean cloth and secure it with a rubber band. -The goal is to allow oxygen in and keep pathogens out. -If you cover the container with cheesecloth, double layer it! The holes in cheesecloth are pretty big and may let pathogens inside. Put your brewing container in a quiet, undisturbed spot. -Every time you brew, a new baby mushroom typically forms. -Undisturbed spots- every time you disturb your brew, the new mushroom has to begin forming all over again. -Takes around 8-14 days when you’re brewing in the 70’s. -Optional: check the pH of your brew. It should be around 2.5-3.5. Set aside 1.5 cups of KT for your next brew. Thanks to Happy Herbalist (and my own experience and research) for some of this information! Note: You do not have to brew a gallon of KT at once! You just need to brew everything proportionally. (A useful conversion: 1 quart = 4 cups). This past Tuesday I performed a Kombucha Brewing Demonstration at Slow Food BU’s second potluck of the semester! The demo included a kombucha tasting of fresh, chokecherry, grapefruit, and lime flavors. This was my second KT demonstration for SFBU, and I love teaching others how to brew kombucha so that they can learn how to do it themselves! It’s a lot cheaper to brew kombucha yourself than to buy it in stores- a 16 oz bottle of GT’s Kombucha at Whole Foods costs more than $3 each. 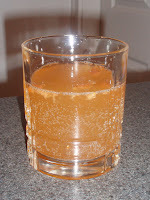 Meanwhile, the main ingredients of kombucha: water, sugar, and tea, are all fairly cheap. I bought a box of 80 organic tea bags for $4 at Whole Foods. I also bought some organic, fair trade evaporated cane juice at the Harvest Co-Op in Cambridge for $1.59/lb. After doing some math, I found out that with those prices, it costs me only $0.17 for every 16 oz of my own home-brewed kombucha tea, and that is when the sugar isn’t even on sale! Of course, the $0.17 doesn’t count for the electricity and time it takes to brew, and there are many more flavors and varieties of teas and sugars that are more expensive. But brewing kombucha is a lot of fun, is much cheaper in the long run, and you can’t get any more local and fresh then brewing kombucha tea in your own home! I even donated a few kombucha mushrooms at the demo- it’s always hard to part with my SCOBYs, because I become so attached to them! But they were getting crowded in their home, so I knew it was time to part ways.